The solid variant is a recently identified variant of aneurysmal bone cysts. This variant has a predilection for the axial skeleton and occurs in persons aged 20 years or younger. Solid variants have a variable radiologic appearance, which ranges from that of a completely cystic aneurysmal bone cyst to a moth-eaten appearance with cortical destruction and soft-tissue extension. See the image below of an aneurysmal bone cyst. Aneurysmal bone cyst of the upper arm. Courtesy of Johannes Stahl, The Virtual Radiological Case Collection. The classic description of an aneurysmal bone cyst includes an eccentric radiolucency and a purely lytic or, occasionally, trabecular process, with its epicenter in the metaphysis of an unfused long bone. The trabeculae in the cyst may create a soap-bubble appearance in the lesion. The margins of the lesion are well defined, with a smooth inner margin and a rim of bone sclerosis. The tumor does not usually extend into the epiphyseal plate until after complete fusion, when it may occasionally do so. The expansion or ballooning of the cortex occasionally may result in the loss of the sharp definition of its margin. In this case, the finding should correctly be interpreted as an aggressive lesion rather than as solely diagnostic of malignant change. New bone may horizontally traverse the angle between the original cortex and the expanded part of the bone; this occurs because the periosteum is lifted. No periosteal reaction occurs, except when the periosteum is fractured. As in the innominate bones, flat bones have osteolysis with an expansile lesion. Expanded bone may displace the adjacent viscera, such as the urinary bladder, when occurring in the pelvis. Lesions in the skull have osteolysis, with expansion of both inner and outer tables with intracranial extension. Mandibular and maxillary lesions are multilocular, expansile, and osteolytic; they predominate in the region of the molar teeth. Aneurysmal bone cysts are difficult to distinguish from malignant lesions in some locations. It may mimic a sarcoma in the ribs, scapula, or sternum, especially when associated with a large soft-tissue component. Cross-sectional CT is the most useful imaging examination, because it can demonstrate the intraosseous and extraosseous extents of the lesion. CT can be used to determine the nature of the matrix of the tumor, especially when tumors are in complex locations, such as the facial skeleton, spine, thoracic cage, and pelvis. Spinal CT can demonstrate stenosis of the spinal canal due to involvement of the posterior elements. Fluid-fluid levels may be seen in the cysts. Fluid levels are depicted only when the patient is lying motionless for about 10 minutes and when the scans are obtained in the plane perpendicular to that of the fluid levels. Fluid-fluid levels also are seen in many other bone lesions, and this finding is not specific to aneurysmal bone cysts. These levels may be seen in malignant and benign lesions, such as giant cell tumors, and in telangiectatic osteosarcomas. The extent of the disease can be estimated better with CT than with plain radiography. The specificity is slightly increased when fluid levels are depicted, but the fluid levels may be present in many other conditions. MRI images of aggressive lesions show tumor enhancement with gadolinium enhancement, especially when they are associated with other tumors. [12, 13] Spinal cord compression and signal-intensity alteration in the cord can be evaluated when neurologic symptoms are present. Gadolinium-based contrast agents have been linked to the development of nephrogenic systemic fibrosis (NSF) or nephrogenic fibrosing dermopathy (NFD). For more information, see the eMedicine topic Nephrogenic Fibrosing Dermopathy. The disease has occurred in patients with moderate to end-stage renal disease after being given a gadolinium-based contrast agent to enhance MRI or MRA scans. NSF/NFD is a debilitating and sometimes fatal disease. Characteristics include red or dark patches on the skin; burning, itching, swelling, hardening, and tightening of the skin; yellow spots on the whites of the eyes; joint stiffness with trouble moving or straightening the arms, hands, legs, or feet; pain deep in the hip bones or ribs; and muscle weakness. For more information, see FDA Information on Gadolinium-Based Contrast Agents. A recent study reviewing the value of fine-needle aspiration cytology of bone lesions containing fluid-fluid levels suggested that the vast majority of lesions with fluid-fluid levels on MRI were benign unless the clinical and radiological features were not atypical. Of 53 patients with fluid-fluid levels seen in bone lesions, 78% were aneurysmal bone cysts, 14% were simple bone cysts, and 8% were lesions with aneurysmal change. Fourteen patients underwent fine-needle aspiration cytology, of which 9 (64%) were nondiagnostic. The remaining patients underwent primary curettage and grafting and diagnosis confirmed all lesions as benign. Therefore, it is believed that it is unlikely that fine-needle aspiration cytology adds value in lesions containing fluid-fluid levels and primary bone grafting may be safe. Demonstration of a solitary lesion on bone scintigraphy helps distinguish an aneurysmal bone cyst from a brown tumor, a hemophilic pseudotumor, etc. Radioisotope uptake is increased. The common pattern is the accumulation of the tracer in the periphery of the lesion, with little intensity in the center; this finding is present in about 65% of cases. The appearance of the lesion is nonspecific, with no correlation of isotopic activity to lesional size, shape, contents, osteoblastic activity, or identifiable histologic abnormality. On angiograms, aneurysmal bone cysts are hypovascular lesions with a hypervascular localized region. 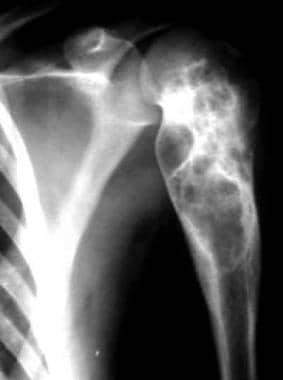 This feature is contrary to that of other malignant lesions, such as osteosarcoma and chondrosarcoma, which have gross hypervascularity. Hypervascular regions in aneurysmal bone cysts may affect the prognosis, because the number and size of the lesions are positively correlated with the likelihood of lesional recurrence after treatment. Saccomanni B. Aneurysmal bone cyst of spine: a review of literature. Arch Orthop Trauma Surg. 2008 Oct. 128(10):1145-7. [Medline]. Unni KK. Dahlin's Bone Tumors: General Aspects and Data on 11,087 Cases. 5th ed. 1996. 382-90. Cugati G, Pande A, Jain PK, Symss NP, Ramamurthi R, Vasudevan CM. Aneurysmal bone cyst of the lumbar spine. Asian J Neurosurg. 2015 Jul-Sep. 10 (3):216-8. [Medline]. Glazebrook KN, Keeney GL, Rock MG. Ultrasound of primary aneurysmal bone cyst. Case Rep Radiol. 2014. 2014:101069. [Medline]. Rapp TB, Ward JP, Alaia MJ. Aneurysmal bone cyst. J Am Acad Orthop Surg. 2012 Apr. 20 (4):233-41. [Medline]. Bush CH, Adler Z, Drane WE, Tamurian R, Scarborough MT, Gibbs CP. Percutaneous radionuclide ablation of axial aneurysmal bone cysts. AJR Am J Roentgenol. 2010 Jan. 194(1):W84-90. [Medline]. Chowdhry M, Chandrasekar CR, Mohammed R, Grimer RJ. Curettage of aneurysmal bone cysts of the feet. Foot Ankle Int. 2010 Feb. 31(2):131-5. [Medline]. Capanna R, Albisinni U, Picci P. Aneurysmal bone cyst of the spine. J Bone Joint Surg Am. 1985 Apr. 67(4):527-31. [Medline]. Hay MC, Paterson D, Taylor TK. Aneurysmal bone cysts of the spine. J Bone Joint Surg Br. 1978 Aug. 60-B(3):406-11. [Medline]. Hudson TM. Fluid levels in aneurysmal bone cysts: a CT feature. AJR Am J Roentgenol. 1984 May. 142(5):1001-4. [Medline]. Kletke SN, Popovic S, Algird A, Alobaid A, Reddy KK. Aneurysmal Bone Cyst of the Temporal Bone Presenting with Headache and Partial Facial Palsy. J Neurol Surg Rep. 2015 Jul. 76 (1):e18-22. [Medline]. Beltran J, Simon DC, Levy M. Aneurysmal bone cysts: MR imaging at 1.5 T. Radiology. 1986 Mar. 158(3):689-90. [Medline]. Hudson TM, Hamlin DJ, Fitzsimmons JR. Magnetic resonance imaging of fluid levels in an aneurysmal bone cyst and in anticoagulated human blood. Skeletal Radiol. 1985. 13(4):267-70. [Medline]. Rajeswaran G, Malik Q, Saifuddin A. The role of needle biopsy for focal bone lesions with complete fluid-fluid levels on magnetic resonance imaging. Skeletal Radiol. 2013 Jun. 42(6):765-9. [Medline]. [Full Text]. Hudson TM. Scintigraphy of aneurysmal bone cysts. AJR Am J Roentgenol. 1984 Apr. 142(4):761-5. [Medline].